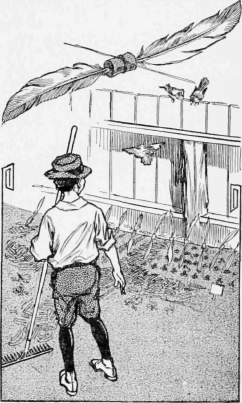 A very neat and successful scarecrow for garden beds can be made as follows: A number of corks are pro- cured, and a feather is stuck in each end of them, as shown. These are tied to a string, spacing them from 1 to 2 ft. apart, and the string is hung over the beds. The slightest breeze will keep them fluttering, and no bird will come to rest on the beds. - Contributed by M. T. Canary, Chicago.